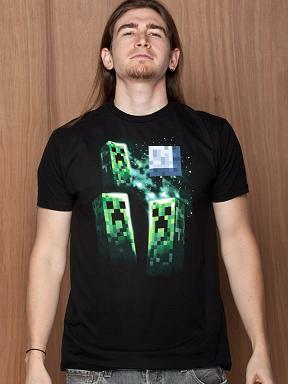 If you want to wear your love for Minecraft on your sleeve (er, torso) then geek-apparel store Jinx has you covered. In case you haven't noticed by now, indie sandbox sensation Minecraft is a pretty big hit with gamers everywhere. Naturally, it was only a matter of time before creator Notch released official Minecraft merchandise - and he's doing it in tandem with noted geek-clothing outlet Jinx (or J!nx, if you're being nitpicky), probably best known as Blizzard's partner for World of Warcraft gear. There are only six different shirts currently available in the Minecraft collection, but fortunately they're all pretty funny. My personal favorite is the "Three Creeper Moon" design you see here (a parody of Three Wolf Moon, of course), but I could definitely go for some of the others - I particularly like how the "One More Block" shirt changes color as it gets lower, like one would experience while digging in Minecraft. As someone who owns more than a few of the Jinx WoW shirts, they almost always produce fairly high-quality stuff, so if you're a Minecraft fan wanting to proudly proclaim your love for the game every time you leave the house, you could do a whole lot worse than to pick up one of these shirts. Of course, why would you ever want to leave the house in the first place? You have Minecraft!